IUJ now welcomes recruiters to our campus to meet internship and employment candidates in Fall Term (mid October through late November). IUJ’s main recruiting season is mid January through late February each year. 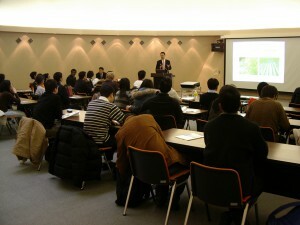 Companies and any recruiters come to IUJ campus and often give a 45 minute overview of their company and recruiting needs. Interviews (pre-screening, selection, group or one-on-one interviews) for internships and employment positions take place in the afternoon. Some companies like to meeet candidates informally at a “Drop By Time” after the more formal interviews. CC&S helps by assisting with candidate selection, arranging itineraries, providing presentation facilities, setting up interview rooms to meet the interview style preferred, and making any arrangement our company visitors might need. Please let us know. if you would like to attend, and your preferred dates. We do welcome recruiters through our Spring Term if the above time periods are not possible. However, many candidates finalize their career and internship plans before this time. Therefore, we encourage participation early on! 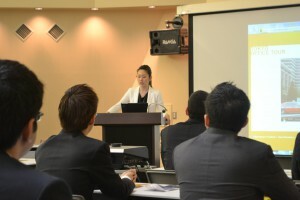 Many more companies participate in our program at other times during the year either from Tokyo, via Video or Teleconferencing, or on campus. Executive Search firms come to Campus for recruiting. IUJ introduces those with whom we have on-going working relations to our students each year. Drop By Time* for another chance to meet candidates informally, or meet new students interested in the company for the future, with a special question, etc. Late Evening train to Tokyo or Dinner in the area before a later train or overnight stay in a local Hot Spring resort. *As an alternative to Drop By Time, some companies offer a reception or Happy Hour using campus facilities. The CC&S staff can arrange catering per your image and budget requirements. Billing is usually by Bank Transfer “Furikomi” at a later time. 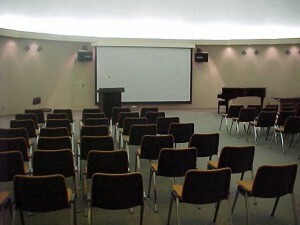 Large presentation hall on the third floor of our Library which seats up to 180. 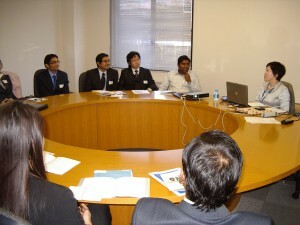 Companies are welcomed to E-mail presentations before their arrival. We will put them on our computers and test them before the presentation. Overhead projectors (paper version or transparencies as you need), white boards, chalk boards, poster paper, etc. Other: If your needs are not listed here, please let us know and we will make arrangements. 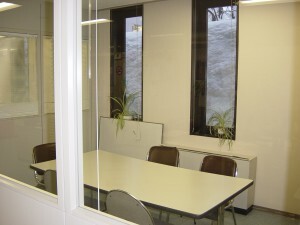 IUJ can prepare 1-on-1 (or 2-on-1) interview space in 4-5 different rooms. 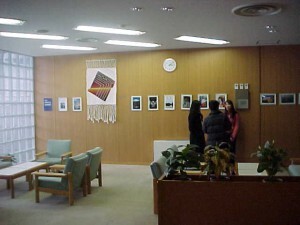 Above photos show one such room near the career counselor’s desk (click on the red X if the photo does not appear). The photo to the lower right shows a larger room option (one of several). Informal Group meeting areas are easily arranged in a variety of lobbies including the one shown to the rights just outside of the Career Services office. Teleconferencing can be set up with calls from the company to the candidates’ rooms (requires redialing) or using a telephone in enclosed meeting space within the Career Office and talking with candidates on the same line in succession. From top to bottom: Just outside the Presentation Hall, Research Institute Lobby, Informal Lounge outside of Career Services.